Go ahead and scroll down below the video to begin learning more about the latest version of the Chevrolet Traverse. Don't stress out over your next purchase; look to the dominant Chevrolet retailer in Springfield for thoroughly researched reviews written by industry specialists. 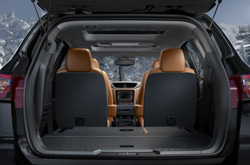 As you read this article, you'll see that it is crammed with valuable facts on all of the things you'r looking for in the new Traverse. Don't wait any longer - get started on your research! Comparing the 2013 Chevrolet Traverse side-by-side with against vehicles like the 2013 Honda Pilot, Mazda CX-9 and the Hyundai Veracruz, and you will see that the 2013 Traverse wins over the competition in several areas. Check out our bullets to see why! Unlike national auto centers, our Springfield car repair facility offers authentic OEM parts, spectacular Chevrolet trained technicians and a 12-month long warranty for all jobs. We're also conveniently located near plenty of local cities. 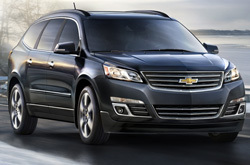 Reliable Chevrolet's auto service men and women will help keep your Chevrolet Traverse in tiptop shape. We can manage a situation as manageable as an oil change, or handle difficult car service and repairs like Chevrolet timing belt replacements, transmission rebuilds, and strut and shock repairs. From the easy to complete to the complex, Reliable Chevrolet deals with it all and offers economical prices, hassle-free service and wizards mechanics. See the link below? That's your key to savings! Glide over and click to see unbelievable coupon specials.